In April 2016. I was at the beginning of my PhD write up and almost totally sedentary so I started Couch to 5k. That month my friend signed me up for Edinburgh marathon the following May, so I had a year to go from Couch to Marathon. It was really great to have that goal ahead of me, working through 5k, 10k and half marathon races during that year. Mainly to be healthy but I also love the social aspect – I meet up with some fellow Harriers before work a couple of days a week and we spend most of our time laughing about something! The countryside around Godalming is also a great reason to get out running. The scenery along the river Wey is second to none on a frosty morning. The Salisbury 54321 half marathon. It was the first half I completed and a horrible struggle but I remember feeling so incredibly proud that I got round the course. An ultra on one of the National Trails. Maybe a few years from now. If you are struggling to get out of a break from running, go out for a half mile run. It is so short you have no excuse not to do it but it breaks the no-run streak. Next goal – finish a 5k race or Parkrun in less than 30 minutes. 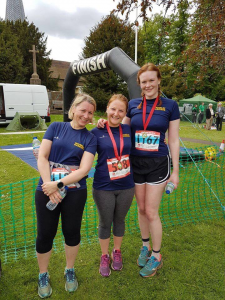 Next race – Farnham pilgrim half. Really looking forward to that one.